Mildred Troxler Gaylord died August 2, 2016, at Moses Cone Hospital, surrounded by her children and grandchildren. The funeral will be held at Jamesville United Methodist Church, 2228 Main St., at 11 a.m. on Saturday, August 6, followed by a graveside service and visitation at the church with the Reverend Larris Tolson presiding. There will also be a memorial gathering open to all at Abbotswood on Wednesday, August 10, at 7:00 p.m.
She was born at home November 8, 1921 to, Mabel (Squires) and Joseph H. Troxler, and grew up on a dairy farm "between the rivers" in the Altamahaw-Ossipee community. She and her nine siblings had a loving and spirited childhood, roaming the woods, swimming in the river, working the farm, and looking after each other. She graduated from A-O High School and Elon College. 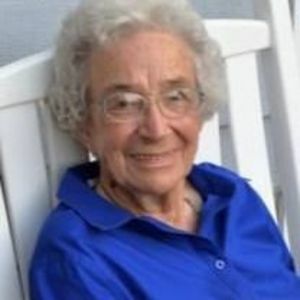 She was married to Tommie Martin Gaylord for 63 years, until his death in 2007. In addition to her parents and her husband, she was preceded in death by her daughter Caroline Gaylord; brothers and sisters-in-law Therman (Dorothy)Troxler, Lloyd (Nell)Troxler, Frank (Rachel) Troxler, Doug (Jewell) Troxler, R.T. (Chic) Troxler, and Keith Troxler; sister Inez Troxler (a toddler); and sisters and brothers-in-law Pauline Nicks Troxler (Glenn), and Betty Jean Troxler Woody (R.F.). She is survived by her brother Buddy Troxler (Tomie); sister-in-law Margaret Fink; children Susan Gaylord Tysinger (Larry) and Mark Gaylord (Paula); her grandchildren Leigh Tysinger Abraham (Dave), Ty Tysinger (fiancé Nura Shadid), Meredith Gaylord Nye (Sammy), Ryan Gaylord (Caitlin), and Savannah Gaylord; and great grandchildren Luke, Carter, and Kendall Abraham, Joseph and Charlotte Nye; and a multitude of nieces and nephews. Mildred spent her career teaching second grade in Farm Life, the Williamsburg community, Swan Quarter, and Cary. A born teacher and a lifelong learner, she taught all who would listen about gardening, nature, or any interesting phenomena. In 1982, she and Tommie retired to his hometown of Jamesville, building a house on the Roanoke River. She lived there until May 2015, then moved to Greensboro to be near her children. While she was a great second grade teacher, she was also a very talented artist. Every time husband Tommie made a career change and they moved, she would start an art class, for fellow teachers or any people in the community who wanted to take up painting. Folks would just show up once a week for fellowship and art lessons for free. After moving to Jamesville, she continued teaching art classes at Martin County Community College and in the community. Hundreds of her paintings - some gifts, some purchases - hang in friends' and relatives' homes all over the state and beyond. Mildred's family is grateful for her legacy - a legacy of faith, love, strength, responsibility, compassion, acceptance, optimism, and volunteerism. She was an amazing wife, mother, grandmother, sister, aunt, and friend, with never an unkind word to anyone. She was a faithful and active member of a Methodist church in every community she lived, the Jamesville United Methodist Church since 1982. We thank the many friends who visited and supported her in Jamesville after Tommie's death. We are also grateful to Abbotswood for their compassionate care and attention. These last fourteen months, Mildred could often be found spending time sharing memories and conversations at Abbotswood, rocking out front in the sunshine or sitting in the main lobby with her new friends.